Do you have some old files containing important or valuable documents that you can't access anymore? 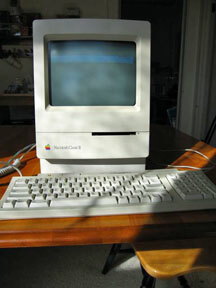 Do you have old MacWrite files that you want to convert to a readable current format? Have you given up all hope of ever seeing your files again? No need to despair. You can try to do the conversion yourself, or contact Jackson's Computers to do the conversion for you. It is quite possible I can convert the files for you remotely while we talk on the phone, using a file-sharing program. You would not have to send your floppy disks to me in the postal mail (and my fee is quite reasonable). First, note this little factoid: old Macintosh computer hard disks are formatted using a different method than new(er) Macintosh hard disks.Copying old files to newer hard drives often removes the resource fork information for each file. Some people use software emulators to convert old documents to Word; I prefer to use the old hardware itself. I found this cutie in the bottom of a closet - an old Mac Classic II. It runs fine. "My Old Files Have No Icon"
If you are using a modern, Intel Mac, the first thing you will note is that the MacWrite files you wish to convert to Word have a generic white icon. No matter what you do - adding ".txt" to the end of the file name or using MacLink, the files cannot be opened or converted. The reason the generic white icon cannot be opened is that the file has lost its resource fork. Without the resource fork, the Mac does not know what type of file it is, and won't open it, even with conversion software such as MacLink. To convert the files, the resource fork must be added back. Conversion using a MacClassic running System 7.01: I used a program called "Change Type/Creator" that runs under System 7.01. The resource fork for MacWrite contains two important pieces of information: the creator is "MACA" and the type is "Word". Change Type/Creator allowed me to change the resource fork to MacWrite. Once the resource fork matched the application that created these documents, I could convert the documents to Word by opening each document in Word 5.1 and then saving the documents. However, this requires typing the document names to save them, which is a bit time-consuming. Using my iBook running System 9.1, I could then use MacLink Delux to batch convert the files to Word 98. Conversion using an iBook running System 9.1: Turns out, Change Type/Creator application is available for OS X. To avoid the use of floppy disks, I downloaded Change Type/Creator onto my Intel Mac, and converted the files to the correct resourse fork. 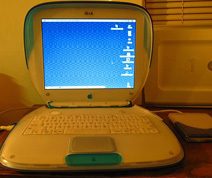 Then, I copied the files over my network to a G4 Mac. I needed the iBook running System 9.1 to use ClarisWorks to open the MacWrite files. When using ClarisWorks to open the files, the file names are preserved. ClarisWorks allows the files to be saved as Word 4.0. I could then use MacLink Delux to batch convert the files to Word 98. Other file types - just give a call.